May is Mental Health Awareness Month. We here at the Green Bay Police Department know that mental health is every bit as important as physical health. When people are unwell, whether they have mental health concerns or physical ones, they need to be treated. Unfortunately, many people in our society with mental health concerns are not receiving the treatment they need. We respond to these tragic incidents all too frequently involving people with untreated mental illness, or people who are at their breaking point due to depression or overwhelming stress caused by traumatic events in their lives. These feelings can be overwhelming, may lead to suicidal ideation, and way too often lead to completed suicides. This can be particularly challenging this time of year as suicide rates are highest during the spring months in America, but there are many other very concerning statistics surrounding suicide as well. •	On average, someone commits suicide every 16.2 minutes. The Green Bay Police Department and many other community organizations want you to know that there is help available. 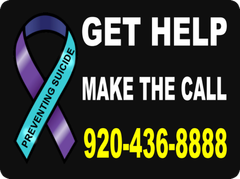 In collaboration with the Brown County Suicide Prevention Coalition, we are placing large signs on all of our squad cars, on Green Bay Area Transit buses, Green Bay Fire Department ambulances and fire trucks. Other area law enforcement agencies such as the Brown County Sheriff’s Department, De Pere Police Department, UWGB Police Department, St. Norbert College, and Pulaski Police Department are also participating in this effort to build awareness and share resources.